Perhaps you're getting over an injury or maybe life just got busy; whatever the reason for the break, you may be wondering how to jump back into a regular running routine. Every situation is unique—resuming training after a stress fracture will look a lot different than a break caused by work or travel—but if you follow a few simple guidelines, your return to running can be frustration free. First, determine if you're truly ready to resume running. If you struggled with an injury or illness, make sure you're physically healthy before jumping back into running. Are you getting enough sleep? Do you have any nagging aches and pains? If your injury was caused by a muscle imbalance, consider checking in with a doctor or physical therapist to work on strengthening the weak muscles. There's nothing worse than getting back into running only to be sidelined a week later. Start fresh. Erase data from your GPS watch, so you're rewarded with a brand new set of distance and speed PRs. The last thing you want to do is compare each run to where you were before. Treat yourself to some new running shoes and gear too. Whatever led to your break is in the past; it's time to celebrate the road ahead. Ease into training. There's no shame in walk breaks. In fact, they can help you avoid injury and allow you to cover more distance. If it's been a while since you've pounded the pavement, try alternating two minutes of walking with two minutes of running. As your fitness improves, gradually extend the amount of time you spend running and reduce walking time (e.g. three minutes running followed by one minute walking, four minutes running followed by 30 seconds walking, etc.). Make it fun. Getting back into shape is always a challenge, but there are some things you can do to make it more enjoyable. 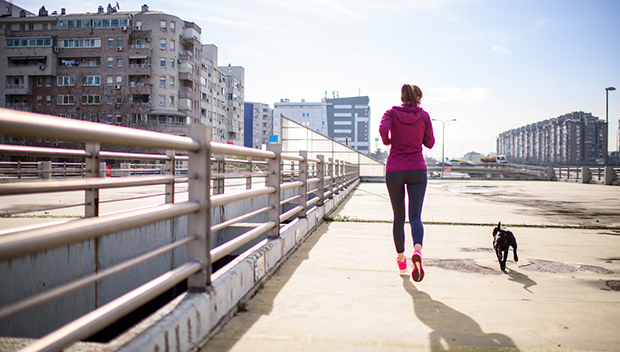 Meet a running buddy on a weekly (or daily) basis to keep you accountable. Join a local running group to add interesting conversation to your miles. Or even run a few miles with your dog or kids. Don't worry about distance or pace—the goal for most of these first runs back is just to become reacquainted with the sport. Choose a goal. Once you've been running regularly for a few weeks, it might be time to start thinking about where you want your running to go. Maybe you're ready to start training for a local 5K or a destination marathon. Or perhaps a fun relay race is on your to-do list. If you aren't ready to race, that's okay too! Set a goal for consistency: say, running three times per week or completing a longer run every Sunday. Working towards a goal—whatever that may be—can give your running purpose. Finally, plan for obstacles. Now that you're back on the running bandwagon, it's time to identify and avoid things that might lead to another running break. If you're prone to injury, make a plan for strength training and PT exercises. Or if family and work keep you busy, brainstorm ways to fit in miles: run commutes? Lunch break runs? A jogging stroller? Now that you're back on the roads, go enjoy those miles!